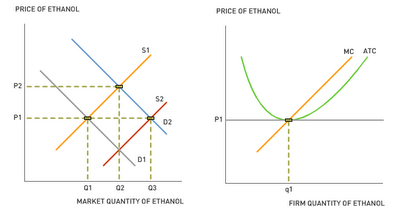 Aplia Econ Blog: News for Economics Students: The Ethanol Bubble? The New York Times reports that in less than one year, ethanol prices have plummeted over 30%. As a result, there is even talk of a government bailout for ethanol producers in case the price of ethanol falls too low! So, why did price spikes in last year's ethanol market give way to falling prices this year? To understand the price fluctuations, we need to know how the short-run behavior of firms in competitive industries (such as ethanol) differs from their long-run behavior. In the textbook model of perfectly competitive industries, an increase in demand causes the equilibrium price of ethanol to increase in the short run—from P1 to P2 in the diagram below. In the short run, higher ethanol prices lead to higher profits for ethanol producers. Notice that economic profits converge to zero in the long run. 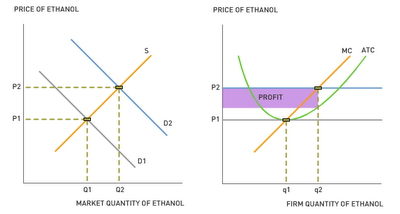 As explained by most textbooks, zero economic profit does not mean that ethanol producers barely have enough to eat. Zero economic profit means that ethanol producers are earning incomes that compensate them for the next best salary they had to give up to go into producing ethanol. Ultimately, in competitive environments, a surge in demand causes an initial spike in prices, but the equilibrium price gradually falls back toward initial levels. In the end, the long-run price of ethanol may not even change, but more ethanol will be produced than before. 1. Referring to the diagram on the left above, why does it take only a short period for prices to spike, but a long period for prices to fall again? 2. 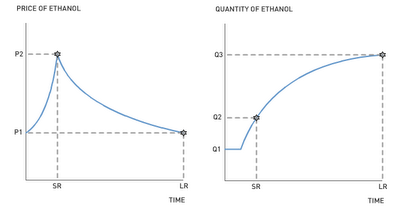 Referring to the diagram on the right above, why is the quantity of ethanol fixed for a period in the very short run? 3. Corn is a key ingredient to the production of ethanol. The New York Times article points out that corn prices have remained high over the past year even as the price of ethanol has declined. How might developments in the ethanol market have contributed to the rising price of corn?